Play Shoot! And Bengal Tiger Slots This Month At Microgaming Casinos. Online Casino News. Shoot! 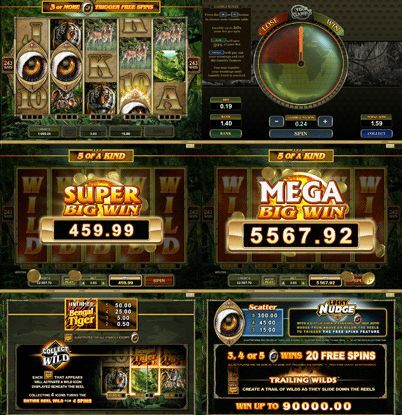 And Untamed - Bengal Tiger Video Slots From Microgaming In May. May's new games are packed with thrilling bonus features and numerous winning opportunities. Get the lowdown on these new games and start playing them at one of the Microgaming casinos! As an added benefit, Jackpot Factory online casinos (All Slots and All Jackpots) are offering double loyalty points on this month's new games through May 11th. This 243-way-win slot machine, featuring vibrant imagery of endangered animals, introduces THREE new bonus features: Collect-A-Wild�, Lucky Nudge� and Your Gamble�. With Ways to Win slots like Untamed - Bengal Tiger, all you need is 3 or more of the same symbol on adjacent reels, starting with the first reel. It doesn't matter if the symbol is at the top of the reel, the bottom of the reel, or the middle of the reel. As long as it's on adjacent reels starting with Reel #1, you have found a Way to Win. Each wild symbol that lands on a reel will add a Wild token to the counter beneath the reel. When 4 wilds have been collected on the counters, the entire reel will turn Wild for the next four spins to bring you even more cash prizes. Turn all 5 reels Wild for huge winning opportunities. Scatter symbols may peek from just above or below the reel edges. If 2 scatter symbols have landed successfully, there is a possibility that the scatter symbol peeking out may nudge on to the screen and trigger the Free Spins. This amazing new bonus feature will increase your chances of triggering the Free Spins feature. This new Gamble feature allows players to adjust the Gamble Odds according to their preference. It also allows players to gamble a single win as many times as they like, while still allowing the player to bank a portion of it. As long has the player has a win amount in the win box, he can gamble all or a portion of it. This gamble feature is all about the player's flexibility and choice of gamble amount. This optional feature will revolutionize the player's gamble strategies. With its stunningly beautiful portrayals of the magnificent Bengal Tiger in its habitat, along with its 243 Ways to Win and all the bonus features, Untamed: Bengal Tiger is a great online casino game. Based on the iconic sports magazine established in 1960, this entertaining 50-payline video slot machine features nostalgic football imagery with a range of bonus features that are sure to score a win with players. The game includes a generous Wild symbol, and if three or more scatter icons land, the Trade �Em Bonus is triggered, leading to either the Free Spins Bonus round, awarding between 10 - 35 free spins with doubled payouts, or the Magazine Bonus for random cash rewards. Relive the glory days of football's greatest moments in this 50-line slot game based on the iconic Shoot! Magazine - one of the most popular sports magazines on the planet. Trigger the Trade �Em Bonus Game for 2 legendary bonus features: the Magazine Bonus, which reveals extra bonus coin payouts and the Free Spins Bonus, to win up to 35 Free Spins, with 2x prize multiplier. Experience the beautiful game and win fabulous rewards! Come play new slots and enjoy some genuine football nostalgia with Shoot! slot machine at All Slots Online Casino, the world's greatest slots casino. Play new games with up to €/$200 bonus on your first deposit. Download FREE casino software, register as a Real Money player, make your first deposit and claim 100% match signup bonus up to 200 free credits to get started! Copyright � Online-Casino-Rank.com 2002 - 2016.